Gazza Ladra Villa is a new built villa with sea view. 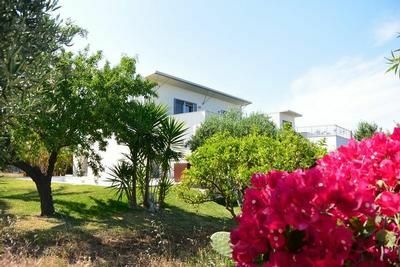 The villa is surrounded by the autochthon flora, outside you can find a wide garden, a furnished veranda 105 SM wide, a swimming pool 2,5 m X 10 m wide and a solarium. The house consists in two levels: on the ground floor you can find a bedroom and two small rooms, a kitchen, a living room with chimney and a bathroom; on the first floor a bedroom, a bathroom and a living area that brings on a panoramic terrace. All the rooms are air-conditioning and small pets are allowed.